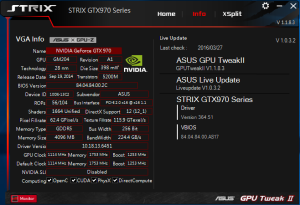 Seems there’s an issue with the Asus Strix GTX 970 card when using specifically the DisplayPort (DP) connector on certain monitor models. Black screen/No Signal between the Windows 10 boot screen and the login screen. When you finally get it too boot without issue, you need to update the VBIOS of your graphics card. I believe I was on version 84.04.36.00.AS15, however since updating to 84.04.84.00.AS17 I haven’t had an issue. There are some older VBIOS versions too; 84.04.2F.00.AS05 & 84.04.1F.00.AS13 & 84.04.1F.00.AS08 though I can’t confirm they had the same issue. If you need to check the version of your VBIOS, you can use the GPU Tweak II download on the same page (though don’t trust the LiveUpdate as it didn’t pick up this update). How do you actually install bios update? The download is a .exe (strix970.exe). Run it on the computer that’s having the issue. hey came across your post and thanks! had the problem for ages and thought my card was on its way out. Much appreciated! !